Unapologetically Female: HAPPY BIRTHDAY TO KATIE! Okay, on my BlackBerry, I couldn't tell that the baby was actually a cake. I thought it was just a really grotesque baby someone had made and you had added candles to. SO MUCH WORSE. Sticking a fork and knife in that thing would please me in ways I'm sure you understand, though. I also really appreciate the kid blowing out the candle whose fingers have been cut off. That's a crappy thing to have happen. I mean, I got a hole in the crotch of my favourite SJP jeans today, but getting stub hands is way worse. Happy birthday, Katie Ett! 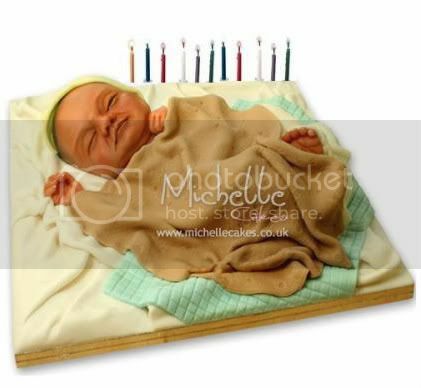 May you have a cake shaped like anything other than that creepy baby.